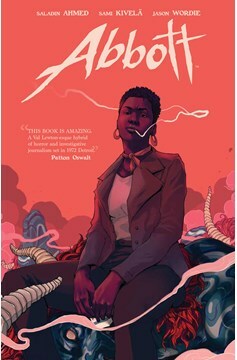 Hugo Award-nominated novelist Saladin Ahmed (Black Bolt) and artist Sami Kivela (Beautiful Canvas) present one womanfs search for the truth that destroyed her family. Hard-nosed, chain-smoking tabloid reporter Elena Abbott investigates a series of grisly crimes that the police have ignored. Crimes she knows to be the work of dark occult forces. Forces that took her husband from her. Forces she has sworn to destroy. Collects the entire 5-issue series. 'THIS BOOK IS AMAZING. A Val Lewton-esque hybrid of horror and investigative journalism set in 1972 Detroit. Take a bow, Saladin Ahmedh - Patton Oswalt œ gMove over, Lois Lane, Abbott's on the beat.h - The Inquirer œ 'This so good on so many levels.' - The Oregonian.